The 12th release on FutureForm Music welcomes John Graham aka Quivver back to the label for a brand new single. The UK born, now USA based producer made his debut on the Aussie imprint in April of 2014 with ‘The Fog’. Quivver’s distinctive grooves have remained a favourite with a wide range of top DJs, most notably John Digweed. He made a return to the storied DJ’s Bedrock Records in July of last year with the Beatport Deep House #1 ‘Takin Over EP’. 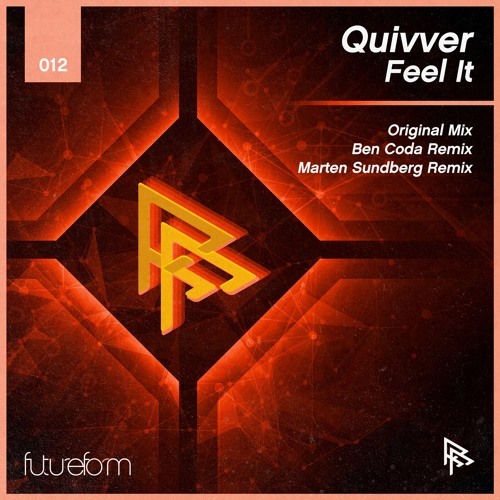 Now as 2016 enters its second quarter we find Quivver returning to FutureForm Music with a brand new single entitled ‘Feel It’ alongside remixes from Ben Coda and Marten Sundberg. The release begins with the original mix and finds John crafting a funky, yet driving journey. Anchored by bulbous bass stabs and a band of swing heavy rhythms, John’s nose for the dance floor has never been stronger. A myriad of vocal elements begin to work their way into the mix as trails of effects reveal a smart tonal theme. With momentum growing flashes of gates and razor sharp stabs bring an electric atmosphere, while several rhythmic shifts keep the groove locked. Drifting tones highlight a stripped down second act, building just enough tension to deliver a heady drop and exhilarating finale. Another sure-fire dance floor bomb from Quivver. The first interpretation of ‘Feel It’ is provided by Ben Coda who is making his debut on FutureForm Music. As a nearly 10 year electronic music veteran, the UK artist has appeared on a host of storied imprints including Baroque Records and Flow Records. His recent collaborative project ‘Nanoplex’ enjoyed a nearly one month long stay in Beatport’s progressive house charts, and he’s delivered an excellent interpretation of ‘Feel It’ here. With a galloping, psychedelic inspired groove and pristine design qualities it doesn’t take long to get fully immersed in this one. Rough bass stabs carve out some incredible hooks while phasing vocals and a trail of deadly effects further tantalize the senses. A subtle acid line highlights a second act and precedes a short, well executed break which is set for dance floor destruction. Huge remix from Ben. The second and final interpretation of ‘Feel It’ is provided by Marten Sundberg who is also making his FutureForm Music debut. The German artist has found a home on Kompakt, Chapter 24 and Manual Music. No stranger to large remix projects Marten has given his distinctive touch to Gus Gus ‘Airwaves’ and now delivers an outstanding interpretation of Quivver’s ‘Feel It’. With a fresh and contemporary approach the German artist has reworked the bass stabs into a state of wonky, rhythmic brilliance. The vocals, while reprocessed, play a large role in the narrative carrying the track on melancholic journey, with indistinct melodies and wispy designs taking you home. Excellent remix from Marten which rounds out a release full of variety and talent from FutureForm Music. Don’t miss it.